On our way to breakfast, a Bison was standing near the Old Faithful viewing area. This picture was taken from a distance with the zoom lens (every one of the Visitor Centers had warnings about approaching wildlife - particularly the Bison, so we kept our distance). After breakfast, we headed up to "Observation Point," which overlooks the Old Faithful area and is an excellent viewing area. 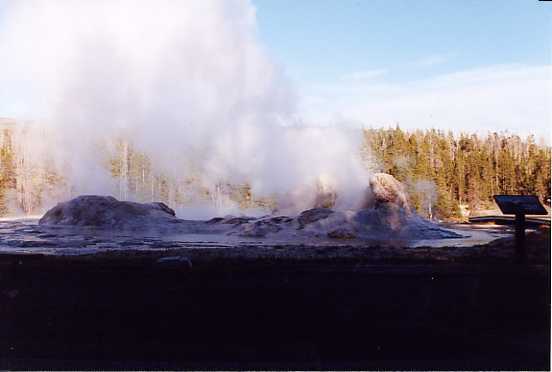 It is 200+ feet above the Upper Geyser Basin (where Old Faithful is located). 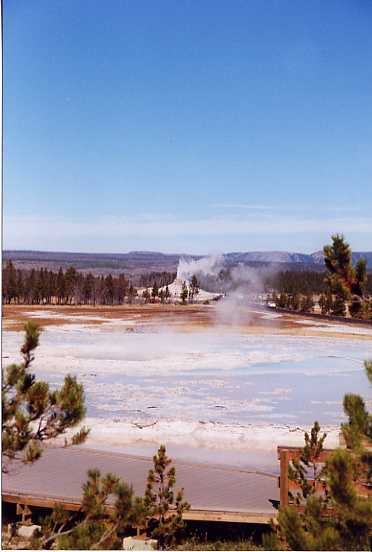 Here is a view of the Basin from Observation Point (Old Faithful is erupting in the left-hand side of the photo). Taking an alternate trail down, we encountered Solitary Geyser. 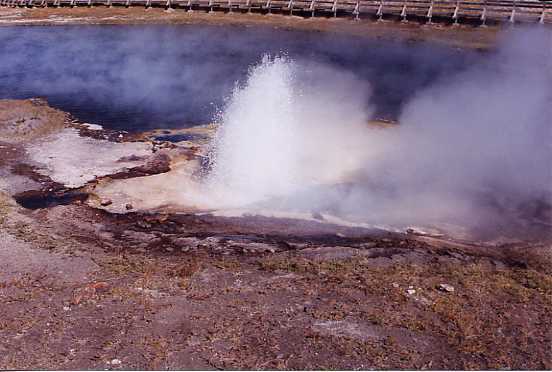 This geyser erupts fairly frequently, so we waited around for an eruption. After our walk up to Observation Point, we got in the car and headed back to West Yellowstone for some shopping and lunch. On the way back, we stopped by a few points we had skipped on the first day. Firehole Lake Drive, a one-way side trip from the main road (highly recommended), is a very scenic side road. 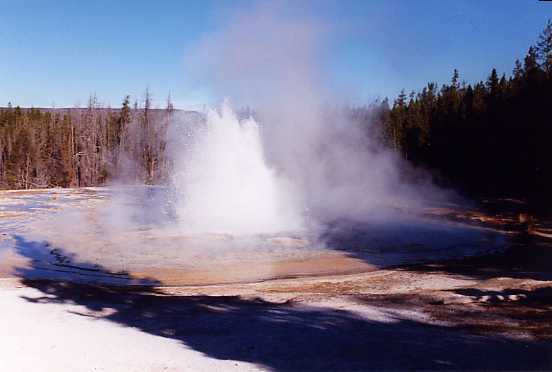 Firehole Pool, Surprise Pool, and White Dome Geyser are all located on Firehole Lake Drive. Another scenic stop along Firehole Lake Drive is Black Warrior Lake. Pictured below are the twin Young Hopeful and Steady Geysers. Bison are very common in Yellowstone - in fact we were advised not to take picture of the first Bison we saw, as there would be plenty of opportunities. 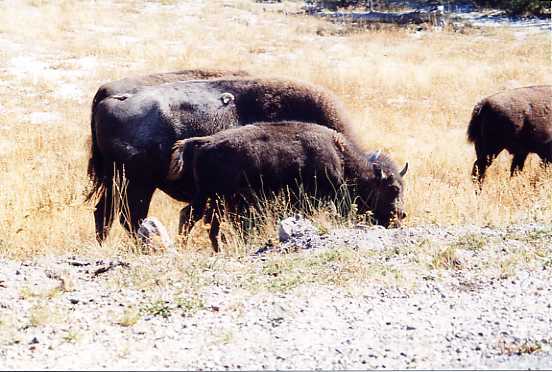 Here is a mother and calf Bison walking alongside the main park road. 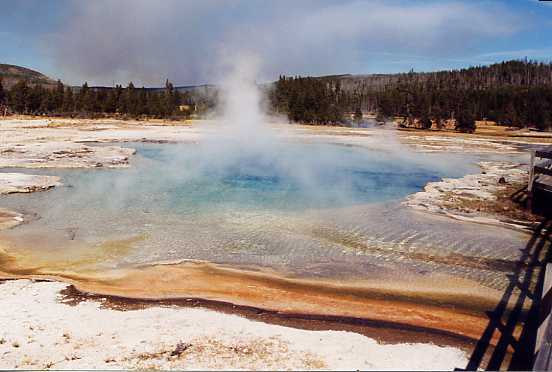 One of the stops between West Yellowstone and the Upper Geyser Basin is "Fountain Paint Pot." Paint Pots are pools that have had most of the water evaporated from them, leaving a thick sulfuric mud bubbling in the pool. 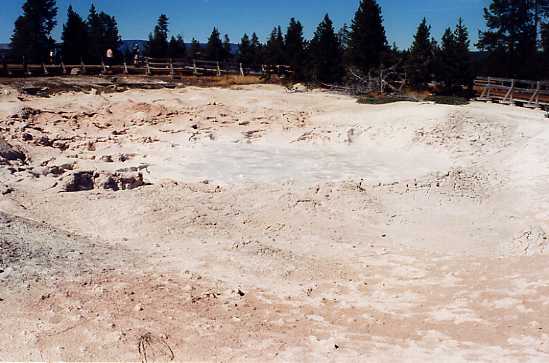 Fountain Paint Pot (first photo) is one of the larger Pots located in the park. 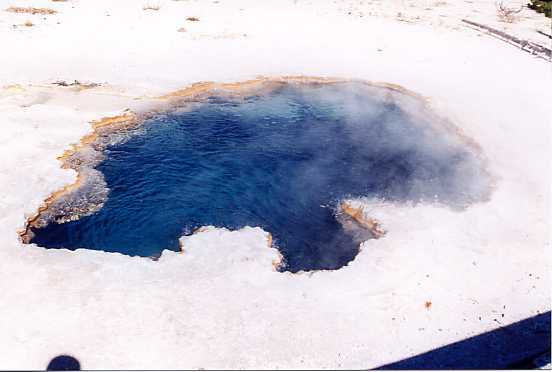 The area also features a few clear pools like Leather Pool (second photo). Fountain Paint Pot is located in an area called the Volcanic Tableland. This is an overview of part of the Tableland. 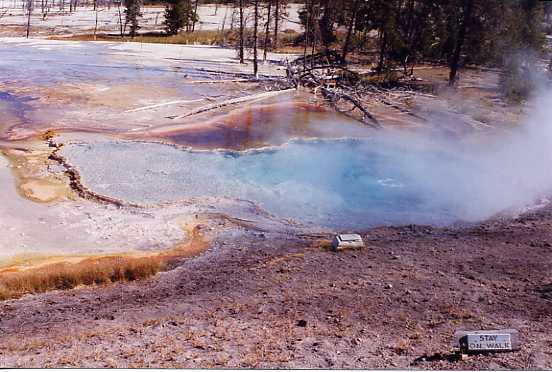 Also located in this area is Clepsydra Geyser. 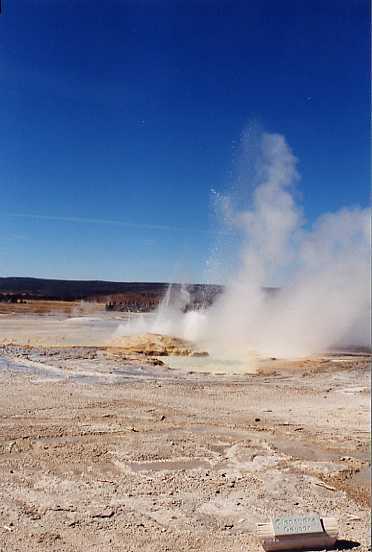 This Geyser erupts almost constantly. 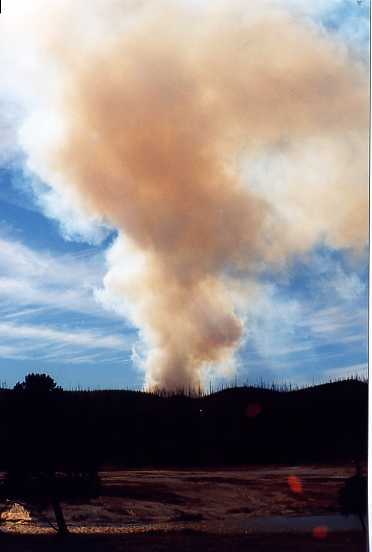 As we approached the Midway Geyser Basin area, we noticed some smoke rising from the other side of the hills. Apparently, there was a good-sized forest fire burning roughly to our South. This smoke was visible for the rest of the day from the Upper Geyser Basin as well, but the fire had burned itself out by the next morning. We also stopped by Biscuit Basin. 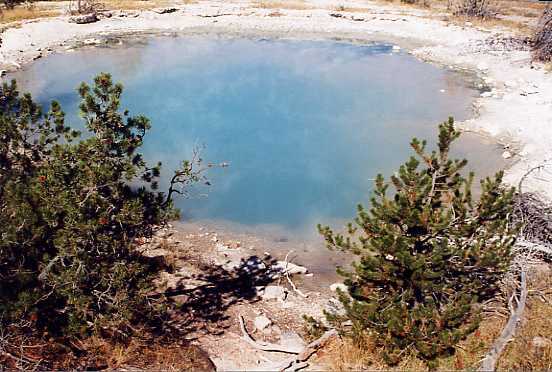 One of the larger pools in the Basin is called Sapphire Pool. 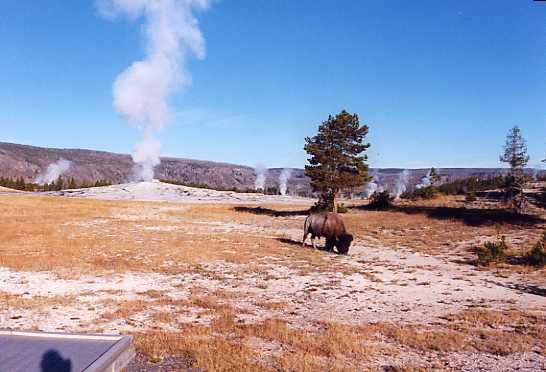 When we arrived back at the Upper Geyser Basin, we had a quick dinner at the Cafeteria and walked down to Grotto Geyser. This picture was taken about 6PM. Then it was a (somewhat footsore) walk back to our cabin to pack up and get ready for the next day's adventures. Instead of heading directly down to the Grand Tetons, we decided to head up to the North side of Yellowstone, which would allow us to see Mammoth Hot Springs.